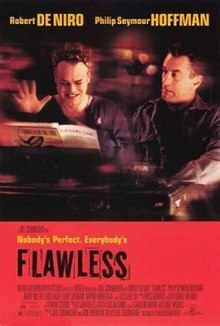 Flawless is a 1999 crime comedy-drama film directed and written by Joel Schumacher and starring Robert De Niro and Philip Seymour Hoffman. Other cast members include Daphne Rubin-Vega and Wilson Jermaine Heredia. It is also the last MGM film of the 1990s. He suffers a massive blow to his ego, and Walter becomes ashamed to be seen in public in such a fashion. Rusty (Philip Seymour Hoffman) is one of Walter's drag queen neighbors, and the two are at-odds constantly due to their differing lifestyles. Rusty has a desire to undergo a transsexual operation, but lacks the money to do so. When Walter comes to Rusty to use his musical talents for voice lessons to overcome his impediment, the pair while at first argumentative and uncomfortable with the other begin to become friends. Walter begins to gain confidence and make strides to return to a normal life. However, their friendship is marred when Rusty shows Walter a stash of money, hidden in the body of his dress making mannequin, which is enough to pay for his operation. When Walter inquires how Rusty got the money, Rusty says he stole it from a drug pusher, who was also responsible for the attack the night Walter had his stroke. Outraged by this, Walter and Rusty part ways angrily. One night, after returning from a drag beauty contest called "Flawless", Rusty is accosted by the criminals who had crept into his apartment to find the stolen money. Walter hears the commotion and runs up to save Rusty's life. Rusty locks himself in the bedroom, and when Walter comes in on them, the criminals turn their attention on him, prompting Rusty to return the favor. In the fight, Walter is shot by the criminals, but the pair are able to subdue them. While boarding an ambulance with Walter, Rusty gives the paramedics the stolen cash to ensure that Walter is okay. The pair again rekindle their friendship, setting their personal differences aside. Hoffman considered De Niro to be the most imposing actor that he had ever worked with, noting how De Niro had the ability during the shooting to "listen" to him as an actor, and in turn, make Hoffman respond similarly because of his unique style of acting. Hoffman felt that his exposure to that level of acting profoundly improved his own abilities as an actor. Review-aggregate site Rotten Tomatoes indicates that 43% of critics gave Flawless a positive review, with an average rating of 5.2/10, and a consensus reading: "Uneven performances, formulaic." Hoffman was praised by critics for his ability to avoid clichés in playing such a delicate role. Todd VanDerWerff praised the warmth of his portrayal of Rusty, commenting that "Hoffman’s work is quiet, moving, and humanistic, and it provides the film with a core Schumacher doesn’t remotely earn. No matter; this is another movie worth seeing almost entirely for the titanic work Hoffman does near its center." Roger Ebert highlighted Hoffman as "one of the best new character actors", remarking that he was "able to take a flamboyant role and find the quiet details in it". Hoffman received a Screen Actors Guild Award nomination for Best Lead Actor. ^ Simon, Jeff (24 September 2000). "Role Player ; Rochester's Philip Seymour Hoffman on Hollywood, good films and the 'star' factor". The Buffalo News, accessed via HighBeam Research (subscription required). Archived from the original on 11 June 2014. Retrieved 19 February 2014. ^ "Flawless". Rotten Tomatoes. Retrieved 21 February 2014. ^ a b "In Flawless, Philip Seymour Hoffman gave warmth to a transgender stereotype". A.V. Club. Retrieved February 10, 2014. ^ "Flawless". Rogerebert.com. November 29, 1999. Retrieved February 10, 2014. ^ "The 6th Annual Screen Actors Guild Awards". Screen Actors Guild. Retrieved February 21, 2014.